A FOUR-try bounty to winger Keith Lulia saw the Tigers maul the equal-first-placed Bulldogs 46-18 in an upset thrashing at ANZ Stadium yesterday. Not many would have seen Lulia's impressive performance coming, after scoring just one try in his past eight games. The best of his quartet came after 55 minutes, the former Dragon and Knight somehow getting the ball down in the corner with his right foot dangling in the air and his left foot in the field of the play. That was part of a second-stanza rout that saw the hosts score an amazing six tries, after the Bulldogs had led 18-16 at half-time. The blue and whites did not score a point after winger Corey Thompson's try in the 21st minute. Both sides traded three tries inside an explosive first 25 minutes, with Lulia getting his second at that time as the big crowd was treated to some amazing attacking football. 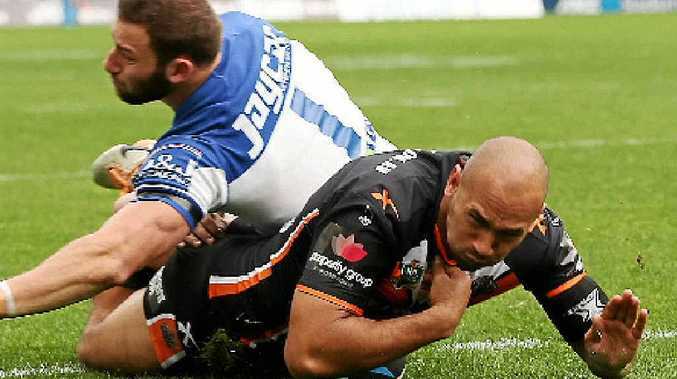 The result may help ease the pressure on under-pressure Wests Tigers coach Mick Potter.